Going to court costs money! As usual, the hearings at Her Majesty's Royal Court of Justice were held having Arthur's name on the paperwork. Sticking his neck out again?!?! What a man!! This time the bill was £1100!!! Luckily, Arthur got the bill down from £1100 to £300. 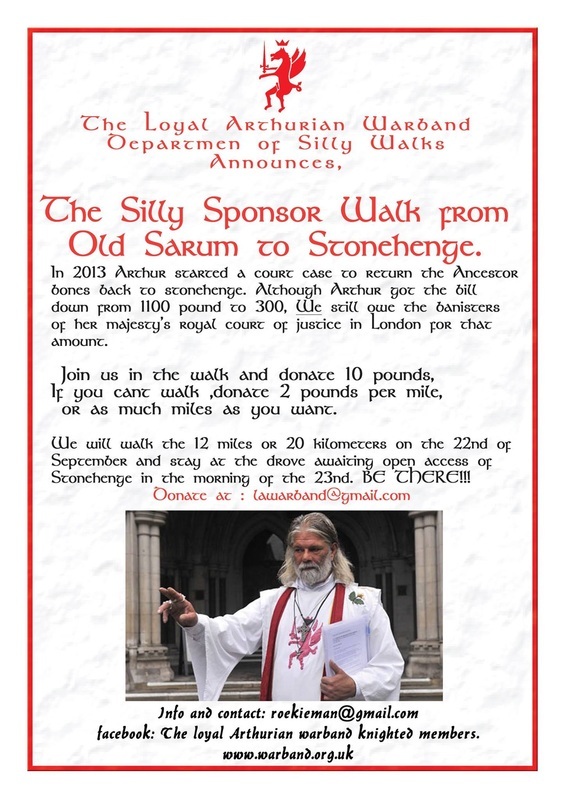 In order to raise the £300 for the Loyal Arthurian Warband legal fund, Warband Amsterdam organised the Silly Walk from Old Sarum in Salisbury up to Stonehenge. It was a small team who took out on the 20 km endeavour, only four of us were willing and capable to face the wind, rain, and cloudy skies; Aneta, Janis, Aarron and Theo. But magic was in the air! A local high pressure area travelled with us all the way, and no rain spoiled our day .... until we entered the byway, but I'll get to that later. We took a scenic route I had prepared back in August. Beautiful views, rolling hills, wild clouds in the sky, and the River Avon in the valley below us. We took time to examine all sorts of healing herbs and edible plants we found along the way. When we were half way there, we took a little break at The Bridge Inn; a lovely tavern close to the River Avon (Thanks for the coffee, Aneta!!). It has been there over a hundred years, I'm sure. We passed several beautiful ancient trees. Some of them, quite surprisingly, from Mediterranean origin! They inspired several moments to contemplate tree planting and supporting Mother Earth and her eco systems. It was not long until the first grave mounds started to appear, heralding the entrance to a sacred territory. Walking through a small forest leading up to the byway, we could actually feel the sacredness of this area. Some sort of mystical silence... difficult to define. There was a red kite in the sky leading us on our way like a beacon. More mounds started appearing. Going over the ridge, I counted at least 12 mounds and I knew the Temple was not far away! Before we crossed the A303, we visited The Women's Circle; a henge where only the remains of women have been found. A lovely spot with considerable spiritual energy so close to Stonehenge, and yet, hardly known. A must for every peregrine Druid male or female! There was one last test the divine powers put us through before we could finally enjoy a view of "The Giants Dance" and a warm meal at byway 12... a cloudburst. Lasting only a few minutes, yet soaking every piece of cloth we were wearing! And then, to our great delight when we reached The Drove, there was the "Dub Bus" with Susan Bonet, Sid Hope, and its owner Garth Tree welcoming us with a hot meal and drink after the long walk. 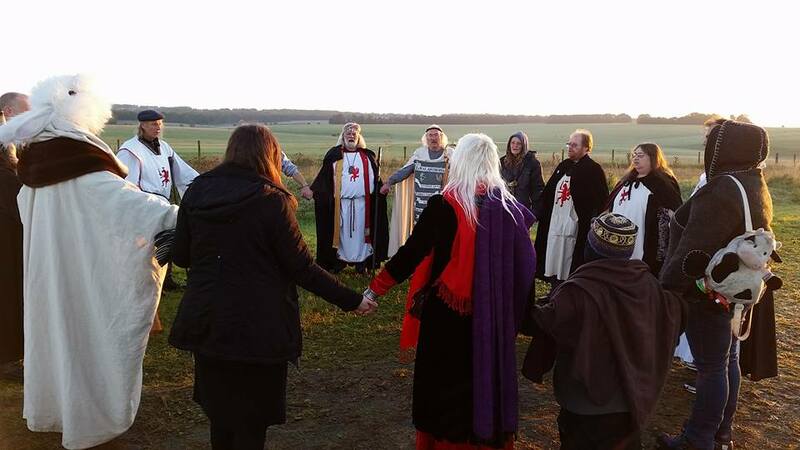 We couldn't have wished for a better “Coming Home” at Stonehenge. We were blessed the next morning with a beautiful sunrise viewed from the stones! It was a day to remember and I'm already looking forward to the next Silly Walk in March. 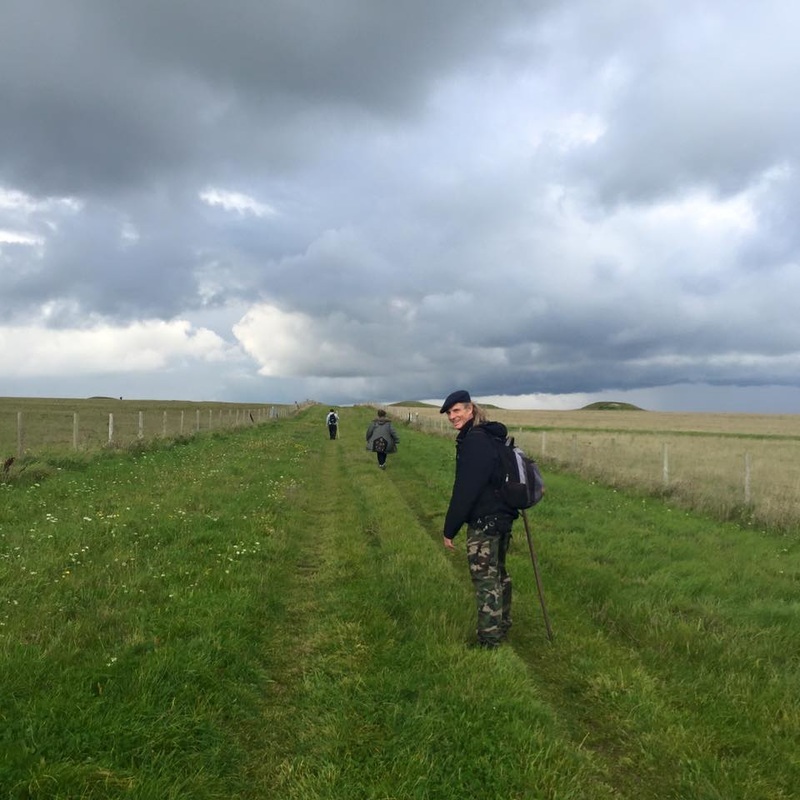 Although we didn't walk silly, we did walk the 20 km in a good mood and had loads of interesting conversations on all sorts of topics from refugees to the building techniques used for Stonehenge. To my surprise, the next day we already collected £200, and together with Steve Mugglestone's donation for the raffle, we reached the goal we had set for ourselves! That leaves me to thank all those who donated to the legal fund, and both James Light and my brother Nico, who were walking the Camino at the same time and inspired me to organise the Silly Walk. Compared to those giants, our 20 kilometers were indeed pretty silly!! Thanks mates!!! See you next year!! ​Sir T. Roekieman van Hagen Loyal Arthurian Warband, Amsterdam.